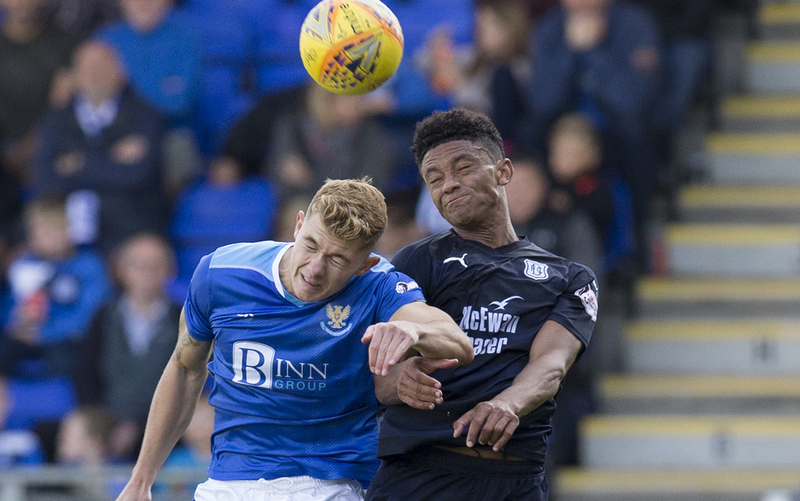 Dundee went down to a 1-0 defeat against St Johnstone in Perth this afternoon. Tony Watt scored the only goal shortly after half time. The Dark Blues had good spells, playing some attractive football, especially in the first half, but a lack of firepower meant that they seldom threatened the Saints goal after falling behind. The Dark Blues made four changes from last week. Steven Caulker, Glen Kamara, Paul McGowan and Benjamin Källman replacing Genseric Kusunga, Lewis Spence and Craig Wighton. Saints made one change, with David McMillan coming in for Blair Alston. With Glen Kamara back in the centre of midfield the Dee were tidy and composed as they built their attacks with neat and inventive passing. Steven Caulker provided the first goal threat with a header from a corner that flew past the post. Tony Watt had Saints first shot when he cut in from the left and tried to curl a shot round Jack Hamilton, who saved. St Johnstone had to make an early change when the unfortunate Murray Davidson, who has had dreadful injury problems, limped off and was replaced by Blair Alston. Saints put two dangerous balls across goal in quick succession. The first, a Richard Foster cross, was deflected up in the air and past the far post. St Johnstone took the corner short and Matty Kennedy flashed a low cross through the goalmouth. Kharl Madianga ended a neat move with a powerful shot from distance over the bar. Adil Nabi also tried his luck from 25 yards and Zander Clark did well to touch it over his crossbar. St Johnstone had two half chances within a minute. First David McMillan swept his shot high over the bar from Kennedy’s cutback. Kennedy then took a heavy first touch, giving himself a tough angle for his shot, which he fired across goal and wide. Next it was the Dee’s turn to go close twice in a minute. Jesse Curran thrashed in a 22 yard shot that Clark managed to beat away. Glen Kamara took up the attack and threaded a pass through to Benjamin Källman, whose shot on the turn drifted inches wide. Kennedy had the final chance of the first half, with a fierce volley from a Drey Wright cross, but it was straight at Hamilton. Dundee had been playing the prettier football, but Saints had looked dangerous with their more direct play. They always tried to get the ball quickly to the wide players, Kennedy and Wright, when they had space. St Johnstone’s preference for moving the ball forward quickly brought the only goal when Dundee were caught out by a long ball that freed Tony WATT to run in on goal from the left and poke the ball past Hamilton. In the next few minutes Saints chased a second goal and Dundee struggled to deal with a couple of crosses. When the Dee recovered their composure they had plenty of the ball, but spent too much time passing their way around a long way from Saints’ goal. With a goal to defend Saints were more tigerish and effective in midfield. Dundee had far less easy possession and had to work harder to hold onto the ball. If the Dark Blues had been defending a lead they would have looked comfortable, but they couldn’t find the tempo, the final passes or movement in attack to pull a goal back against a well organised Saints defence. The second half drifted by without much happening for long stretches. The Dee probed, with little conviction, and Saints carefully kept them at bay, working hard to maintain their shape and concentration. Saints might have seen less of the ball but they used it more dangerously, trying to hit Dundee on the break, without ever quite managing to get it right. Elton Ngwatala and Sofien Moussa came on, replacing Kharl Madianga and Jean Alassane Mendy without changing the pattern of the game. Craig Wighton also made a late appearance from the bench and after a Curran break down the right he chipped over a good cross for Moussa, whose header from 10 yards was well saved by Clark. That was the only time in the second half that Dundee forced the Saints keeper into serious action. After three league games Dundee are still pointless, having lost by a single goal each time. The story is familiar. With the forwards struggling to score just one mistake at the back can prove fatal. The Dark Blues might look like one of the better footballing teams in the division when they have the ball but today Saints were more effective where it really matters, in either penalty area. Unused subs: Mitchell (gk), Anderson, Scougall, Gordon. Unused subs: Parish (gk), Kerr, Jefferies, Spence. Referee: Steven McLean; Assistants; David Doig, Andrew McWilliam. Fourth Official; Kevin Clancy.